I have been focusing a lot of attention on performance tuning AX over the last year. The company I work for has now been live on AX 2012 R2 for about a year and a half and we’ve spent a lot of effort tuning indexes and re-writing code and processes to speed up our system. Spending so much time thinking about performance has caused me to change the way I write and fix code so I figured I would share. Outside of making sure you have good indexes for your tables, the biggest offender I’ve found for slow processes is unnecessary database calls. I see it and have been guilty of writing it in code all the time. You have a process that loops through records, evaluates some conditions, grabs related data if necessary and then performs some action. The offender in this scenario is “grabs related date if necessary”. It is really easy to write a basic query to start off with and then, in the middle of your process, grab more data. AX 2012 makes it easy for you with Table::find() methods and by having the CreateNavigationPropertyMethods property on a table relation. This allows a developer to grab a related table from an existing table buffer using a method call that matches the relation (e.g CustTable.DirPartyTable_FK()). While this is incredibly useful, the danger with this approach is that it adds another database call to the process. Examine the job above. I have 2 while select statements that loop through the same number of records. I have used different ranges so I could show times for cached and non-cached results. The first loop grabs the project records and then during processing makes 2 more database calls to get the CustTable and then the DirPartyTable. The second loop uses joins and a field list to minimize both the amount of data returned and the number of database calls. I ran this process twice. The infolog shows that the first loop took 5 seconds to run and the second loop took 1 second to run. The second time I ran this process the first loop fell to 3 seconds because of database caching. This means that the first loop takes 5 times longer to run when it’s calling the database and 3 times longer when its reading from the cache (a precision of seconds is probably minimizing this difference). 5 seconds doesn’t seem like a long time to process over 1100 records but there are a few things to consider. This process isn’t doing anything but grabbing the records and this job was run in a stand-alone development environment. The client, AOS and database are all on the same server and there is no one else using it except for me. Imagine how much longer this could be if there were lots of users running processes in the system or if the components were separate and the network happened to be slow. Each database call can add up to 2 remote procedure calls depending on where the code is running. In this instance, my job is running on the client so the number of RPC’s is twice the number of database calls (1 from client to AOS and 1 from AOS to database). The first loop has 2 RPCs for the while select, and then 2 (number of calls) X 2 (client and server) X 1169 (number of records) for a total of 4,678 RPCs and 2,339 database calls. The second loop has 2 RPCs and 1 database call and the potential to give you just as much data as the first loop. That’s a pretty crazy difference! I now write a lot more X++ pseudo-SQL with joins when writing new code and changing existing processes. The amount of time that can be saved during runtime far outweighs the extra time it takes to plan out your processes to grab all of the data that is needed the first time. This is potentially the last of my PowerShell posts. This function wraps up what I currently use in my environment to build and deploy for AX. This function uses some of the same functions used by the Build-AXModel function as well as some of the functions that ship with AX and also the custom functions that have been added since the build post. As with the Build-AXModel function, I will not be including this one in the module either. I am hoping that most users will be able to use the function as-is to create a push process but some users will need to modify it to make it work for them and all users will need to modify the variables. Please feel free to change this function to fit your needs. I have built the template I have to fit mine, although I have added looping to certain function calls to try and make it as re-usable as possible. You should add the function to your session using your profile as you’ve done for the build function. All 3 variables should be used, although you could specify both the ModelFile(s) and the ConfigPath in the Variable path file if you’d like. I am not expecting another blog post explaining the variables file as all of the concepts that I used for the build variables will apply to this variable file as well. Install-AXModel is a function that is part of the AXUtilLib.Powershell module. You should definitely check out the link and make sure that you understand what the Conflict parameter does. Your specific environment may dictate that you change this value when importing your model(s). There is also a NoOptimize parameter that can be used when importing multiple model files. I did not go this route as I only have one model but it may be worth looking into. I did want to discuss my hotfix solution in step 5 very quickly. I have added the ability to import .xpos in my build push as we very often discover issues during regression testing. Depending on the issue, we create hotfixes instead of a new build. I export these hotfixes out of TFS and add them to a “hotfixes” folder located in the same location as the model file being imported. The Push-AXModel function will loop through and import all .xpos located in this folder, sorting by LastWriteTime. Make sure you create the .xpos in the order that you want them imported. Publish-AXReport is a function that is part of the Microsoft.Dynamics.AX.Framework.Management module. The variables file is defaulting the ReportName value to the wildcard for “all”. I personally don’t do this in my environments because we only have a handful of reports that have been modified/created so I just create an entry for each one. It is faster to deploy the few indiviual reports that I have. Since I also manage our builds, I can add new reports to the variable files in each environment if necessary. I still have one manual process to accomplish when pushing my models. I have no function for deploying cube changes I don’t currently have a strategy to accomplish this in PowerShell. As we very rarely make cube changes, it hasn’t been a big issue. There may be other push processes that are specific to your environment that you may need to automate as well. If there are, I would be interested in hearing what they are and how you accomplished it. One last thing, I have cleaned up all of the standalone functions in Codeplex. The only standalone functions that are in there now are Build-AXModel and Push-AXModel. Everything else is part of the module. The Clean-AXModel custom PowerShell function will allow you to clean up default AX layer models. Custom AX models allow you to use Uninstall-AXModel from the AxUtilLib.Powershell module to remove them from your environment but the default layer models (e.g. ‘USR Model’, ‘VAR Model’) will throw an error if you try to delete them. This is where Clean-AXModel will shine. I use this function when preparing a non-production environment for a model push. In my environment, we only develop in one layer/model. It is possible that another developer has accidentally changed an object in another layer/model however. Clean-AXModel ensures that the only code that exists in my pre-production environments is the code that I’m going to bring in with my model push. I have updated the D2DDynamics module to version 1.0.5 with this function. I have also modified the Send-Email function with this changeset. I have fixed a bug that was brought up to me from a user regarding adding multiple “to” addresses to an email. This should now work. This function has only be run by me on the AOS server. It has been tested using AX 2012 R2 CU6 and CU7 but I would expect this to work for any version of AX 2012. The Get-AXTFSCombinedXpo custom PowerShell function is used for getting code out of TFS as an .xpo. At my current job, we sometimes have to hotfix .xpos for builds. I know that the trend is to move away from pushing .xpos but when it comes to hotfixes for builds, .xpos are significantly faster than creating another build and pushing a model. We have a team dedicated to unit and regression testing and we regression test every model build before it is moved to production. When we discover issues in the model build, we hotfix the build using .xpos so we can continue regression testing. This PowerShell function uses both tf.exe and the TFS Power Tools to export the .xpo. To use this function, you will need to run it on a server that has Visual Studio installed and connected/synched with TFS and have the TFS Power Tools installed. Because of these requirements I run this from either my development server or from my development build server. You will need to add some code to your profile as we’ve done for other functions. The tf.exe reference should already exist in your profile for the TFS sync used by the build function. The Microsoft.TeamFoundation.PowerShell reference is for the TFS Power Tools. This function can be used to grab a single changeset, a range of changesets, a label version, or even the entire codebase. I primarily use it to get a single changeset or a range of changesets. Synching the TFS working folder is significantly faster than trying to grab a label version or the entire codebase with this function so I wouldn’t recommend using it for those purposes but it is able to if you want it to. To get a range of changesets, use the date field information (datetime) of the TFS history to set the DateFrom and DateTo parameters. Then use the latest changeset value in that range to set the Version parameter. You can pass the DateFrom and DateTo as strings and the parameters will convert them to datetimes. I have only tested the formatting of this using the en-us datetime format (M/d/yyyy h:mm:ss tt) so it is possible that you may run into issues if you are using another datetime format. Please let me know if you experience any problems. I am using this function with Visual Studio 2012, TFS 2012 and AX 2012 R2 CU7. It has not been tested with other versions but may work with them anyway. I am releasing this function as part of the D2DDynamics module (1.0.4) and as a standalone function at the current time. I am determining whether or not I will remove the standalone functions that also exist in the module from Codeplex in the near future and will notify you through my blog if I do. The Refresh-AXAifPort custom PowerShell function is very useful if you have customized AIF services. It will allow you automatically push modifications to these services when you run it after Refresh-AXServices. This is the first PowerShell function that I’ve published that requires AX code to work. This function calls a custom Class\Static Method called D2DAutoRunHelper::AifPortRefresh(). This class automates the steps available from the AifInboundPort form. This function is being released as a stand-alone function as well as part of the 1.0.3 release of the D2DDynamics module. The 1.0.3 release also includes a change to the Restore-AXDatabase function and Build-AXModel_Variables.ps1 to change the timeout parameter to use minutes like every other function in the module does. This function should also only be run on the AOS server. It has been tested using AX 2012 R2 CU7 but will probably work for other versions. I’m going to start off with how I set up TFS for a build. I have my main code branch in TFS, D2D_AX_DEV, that is used for all of my development environments. Each AX development environment has TFS setup and pointed to this code branch. I have also set up a branch off of D2D_AX_DEV called D2D_AX_REL. This is my release branch. I merge everything into the release branch that is going to be included in the build. I then point my build function to the release branch. Outer section at the beginning and end that set up the variables passed through the parameters and that email start and completion of the function. Set up build variables: This section uses variables in the Build-AXModel_Variables.ps1 file that is passed in through the VariablePath parameter to set up the environment for the build and model export. Prep build environment: This section restores the AX environment back to a vanilla instance for the build and gets TFS and the combined .xpo file ready. Import/Compile AX (Main build step): This section pushes the TFS code into the build environment and compiles/syncs everything and gets the environment ready for a model export. Export model: This section exports the model file into your build folders. The individual steps and explanations for what they are doing can be found in my earlier posts. I have done some things in my Build-AXModel_Variables.ps1 file to make this more of a generic process to be re-used however and I would like to clarify what I’m doing. There are multiple places in my build function where I loop to allow functions to work on different layers and models (model creation, .xpo creation/import, label file import, VS Project import and model export). In my original process this wasn’t necessary as I only build one model in one layer. The way it is currently built however, allows for multiple layers and models. I handle this looping process using foreach statements and ArrayLists in my variables. I used ArrayList vs array as the behavior with ArrayLists was a lot more dependable when looping. It is a simple construct. I build variables for the individual parameters needed for a function call. I then build an ArrayList to hold grouped variables for a function call that will allow me to loop through an ArrayList of my grouped ArrayLists and call the function multiple times. My loops are only through the VAR layer and for my D2D model but you can easily add more variables for layers and models to these ArrayLists to allow multiple function calls. Make sure you build your ArrayLists in the order in which you want to process the layers and models. The area that is most likely to need customization to fit your specific build are the steps in the “Import/Compile AX” region. You may need to change the order of the server/node compiles or change the server compile to a client compile. You may also need to change the function used to import the VS Projects and add some node compiles if you have some complicated dependencies. As I said in the blog post covering the function, I’m not planning on putting this function into the module because of the likelihood that you will need to modify it to fit your needs. I’m hoping that some users will be able to use it out of the box but I’m sure there are some who will need to make changes. The steps in my version of the function fit the current needs of my build process. I apologize for the extra week between posts. It has been a lot of work to get this function ready to post. I built the D2DDynamics PowerShell module using cleaned up functions that were based off of the original functions I used to create my build. Even though I tested all of the functions as I built them, my actual build was still using my old functions. Getting my new build ready required me to bring my module into my build environment and re-write and re-test my build. I also wanted to get at least one build done in my environment using the new function before posting it. Hence, the extra week. I’m not going to get too in depth regarding the function this week. I am making it available so people can look at it and try and get an idea of what I’m doing. I will be covering the specifics of it in future posts. Also, I will not be including it in the module. It is possible that a large percentage of users will be able to use the function as-is to create a build but some users will need to modify it to make it work for them and all users will need to modify the variables. You should add the function to your session using your profile. I have also updated the D2DDynamics module to version 1.0.1. This release includes some documentation changes, a new Comment parameter for the Sync-AXTFSWorkingFolder function and I’ve exposed the Send-Email function because I use it in the Build-AXModel function that isn’t part of the module. To use the Build-AXModel function, you will need to download and setup the latest version of the module (1.0.1). All 3 variables should be used, although you could specify the ConfigPath in the Variable path file if you’d like. I have defaulted both values in the function that I use already to make my life simpler. Feel free to do the same thing in the function that you use. This function is not designed to be used “out-of-the-box”. You can customize the defaults and you will need to customize the Build-AXModel_Variables file that is used for the VariablePath parameter for this function to work. I will get into what/why/how to use the variables in a later post. For now you can look at the 2 files (Function_Build-AXModel.ps1 and Build-AXModel_Variables.ps1) and get an idea for what is going on. This module is dependent on the 0.3.5 release of the DynamicsAXCommunity PowerShell module among others. There are also some variables that should be set up in your profile if you are planning on using the functions. The profile that I use can be found in Codeplex at Source Code -> Powershell -> Profile -> Modules -> Microsoft.PowerShell_profile.ps1. Please use this as a reference for setting up your own profile. To install the module, copy the D2DDynamics folder to the module folder for PowerShell. On my Server 2012 server, the location is “C:\Windows\System32\WindowsPowerShell\v1.0\Modules”. After the module is there, you should be able to open PowerShell and add it with the Import-Module cmdlet. Future posts will include the steps necessary to create a custom build process using the module as well as more functions that can be used for deploying your build to other environments. Please let me know what you think of the module and if you find any problems with using the functions in your environments. The Import-AXVSProject function is the second of 2 functions to support more complicated Visual Studio project scenarios. I have taken this approach from here. I don’t personally use this approach in my build as my current environment doesn’t require it but this function along with my earlier post should allow a user that does have these complicated scenarios to import VS projects for a build. This function uses a system class to import the VS project. The AX SysAutoRun functionality allows users to call a static method of a class in AX. The AX system class SysTreeNodeVSProject has a static method called importProject() that takes an argument of a VS project file and imports it into AX. Using the Import-AXVSProject function in conjunction with the Compile-AXXppNode function will allow you to import VS projects and compile them in any order that you need to. If you have projects that are dependent on AX code to compile correctly, you can compile the AOT or specific nodes of the AOT before importing and compiling the project. If the AX code or another VS project is dependent on the VS project, you can change that order. These functions allow you to import and compile in a manner that gives you control over order and saves time from a full AOT compile. This is the last function necessary to create an automated build process. In the coming weeks I will be cleaning up my current posts to fit with some changes I have made to the existing functions and I will post a blog about putting these functions together to allow you to automate your build. I will also be releasing a module to Codeplex in the next month that will have all of the functions packaged up for easy deployment. 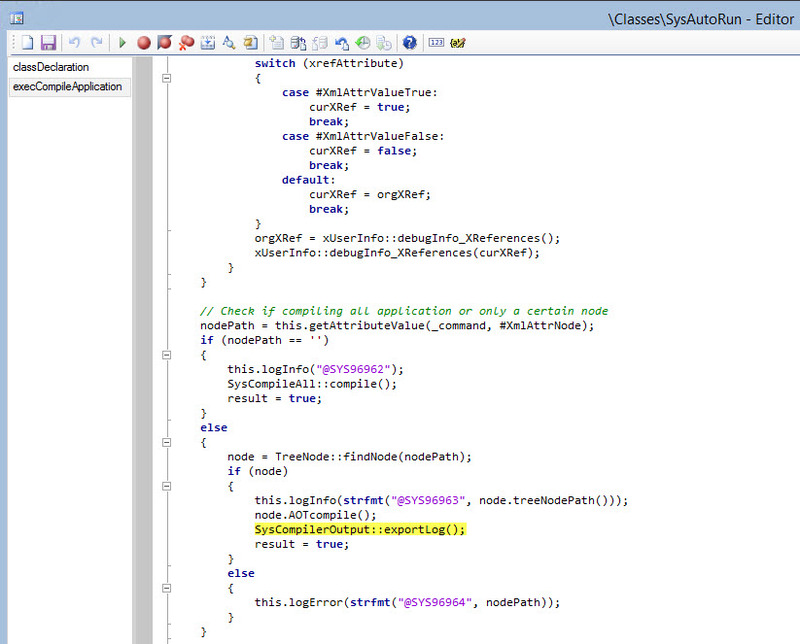 The Compile-AXXppNode function is the first of 2 functions to support more complicated VS project scenarios. I have taken this approach from here. I don’t personally use this approach in my build as my current environment doesn’t require it but this function along with my next post should allow a user that does have these complicated scenarios to import VS projects for a build. This function can return the compile results in an email but it requires a code change in the SysAutoRun.execCompileApplication() class method. When compiling everthing, the SysCompileAll::compile() class method calls the SysCompilerOutput::exportLog() class method. This exports the log to the user’s “C:\Users\..\Microsoft\Dynamics Ax\Log\” folder. If you want this log to be available, you need to add the SysCompilerOutput::exportLog() class method call to the node compile section of code. I realize that this is a chicken and egg type thing as this custom code would need to be imported into the build environment before importing and compiling VS projects but it is possible to implement. The AutoRun xml does have the ability to specify a log file as well but this log file will only show you what nodes were compiled. There is no message regarding the results of the compile in it. Because of this limitation, I didn’t used this log in the function. As I said in the last post, I have been in contact with Martin Drab. He is developing the DynamicsAXCommunity PowerShell module that I piggyback off of. He has incorporated the last change that I needed for my functions to work in the latest build of the module (0.3.5). I haven’t tested it out yet, but my functions should now work with his module with no customizations.